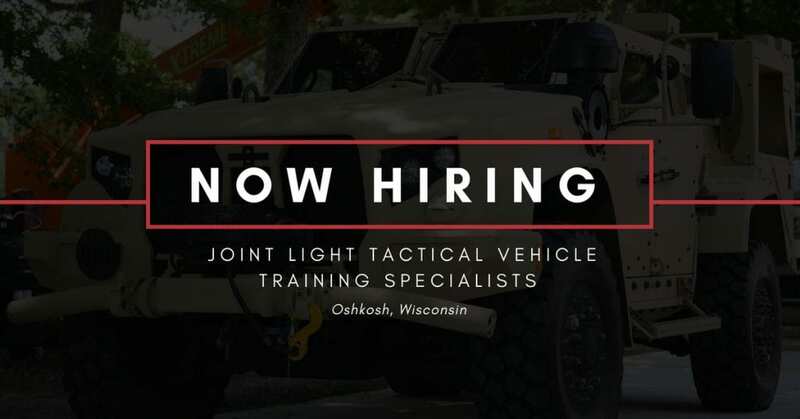 STS Technical Services is seeking to hire Training Specialists/ Lead Field Service Representatives in Oshkosh, Wisconsin to join the largest military vehicle upgrade project in US history, the Joint Light Tactical Vehicle- JLTV! You will be trained in Oshkosh, WI for 6 weeks where you will learn all pertinent operations associated with this brand new vehicle. Overall, Training Specialist FSR’s will train subsequent FSR’s on how to troubleshoot vehicle systems to include; powertrain, cooling, electrical charging, suspension, heating and ventilation, steering and system integration support of ancillary equipment. The FSR will also help to provide orientation and instruction to key personnel with respect to operations, maintenance, repair and parts supply as well as support efforts for equipment retrofits at military bases all over the country.